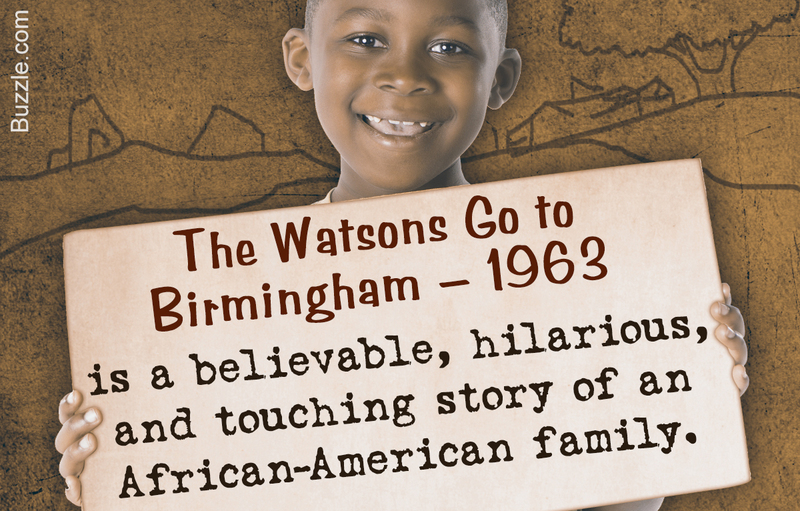 The Watsons Go to Birmingham - 1963 by Christopher Paul Curtis is an endearing story that follows the life of an African-American family living in Flint, Michigan. Set against the onset of the Civil Rights Movement, it beautifully portrays the 'Watson Family' as a strong family who help and support each other in trying circumstances. This Penlighten post gives you a summary of the lovable story of 'The Watsons Go to Birmingham - 1963'. Christopher Paul Curtis is an African-American award-winning author of children's books. Curtis - before donning the cap of a writer, worked in an automobile factory for a considerable time. Having grown weary of the monotonous work, he took to writing during breaks. Finally, he decided to bid adieu to his job and began working on his first novel, which was 'The Watsons Go to Birmingham - 1963'. The narrator of the book is the 10 year-old Kenneth Watson a.k.a. Kenny, who welcomes us in the story by talking about the unmerciful biting cold climate on a Saturday in Michigan. Despite swaddling themselves in winter wear, there is no reprieve for the Watson family and so they are all huddled up under a blanket on the couch. We are then introduced to the members of the family - Momma, Kenny's mum who isn't acclimatized to the cold weather and who also rues her decision for not listening to Moses Henderson (he sought her for marriage) about settling in the North. Next is dad, who is in good touch with his humor (he calls Moses Henderson Hambone Henderson because of his weirdly shaped head) and jokes about momma's gap between her teeth, for which she covers her teeth every time she spurts into a laugh. Then comes the official 'juvenile delinquent' of the family and the oldest of all siblings, Byron, with a shortened moniker as 'By'. The last in the brood is the youngest and religious of all, Joetta, also lovingly called Joey. The family, in order to get some warm solace decide to go over at Aunt Cydney's. Kenny and By are instructed to rake up ice from their Plymouth car, which Kenny derisively refers as' turd brown' and the 'Brown Bomber'. Kenny gets down to the chore assigned while Byron simply shuffles off. Kenny then hears Byron's bawl and is reminded of the unsavory trick that Byron and his friend played on him while testing him on ' How to survive a blizzard'. Kenny thinks that Byron is calling out his name to pull his plonkers once again. However, he reluctantly goes to see Kenny and finds that Byron's lips have frozen onto the sideview mirror of the car. The situation turns comical when everyone in the family break into tears - momma (as By's lips won't come off even after pouring water on it), Byron (for an obvious reason), dad (tears stream down dad's cheeks not because of By's misfortune but for his own hilarity), Joey (as By's crying), and lastly Kenny (as he is hit hard by Byron as he pours water on his lips). Kenny is grateful for the fact that By is his kin. Had it not been for him he would have got bullied many times worse than he gets. Kenny gets picked on for two reasons - first because of his 'lazy eye' and second for being nerdy. But with two new entrants in the school, he feels happy as his days were going to change for good. Kenny wants Rufus Fry, one of the two entrants to be his personal 'saver' and goes on becoming good friends with him. Kenny realizes that Rufus is a genuine boy and is surprised to learn that he has shot from a real gun and has also eaten a squirrel. Their camaraderie deepens after Kenny invites him over to play with dinosaurs. But one day, when Rufus was being picked on for his Southern accents and clothes, Kenny too joins them and wounds up hurting Rufus' feelings. But Kenny feels contrite for his behavior and when Rufus doesn't talk to him even after apologizing, momma intervenes and the two get back to being friends once again. Byron's behavior verged on aberration, much to momma and dad's chagrin. We are told about Byron's infamous incidents. Notwithstanding momma's warnings, Byron has been caught trifling with matches many times. Once when momma totally loses her wig over Byron's relentless playing with the fire, she decides to burn his finger. But, little Joey, who was scared for her brother, would put out the match every time momma lit it. Second incident was the pedestal of his crassness, when he got himself a conk. Joey and Kenny are tensed as to how dad would react at Byron's Mexican hairstyle. But dad, instead of duffing him up, quietly shaves his hair off and pours his after-shave on his head that leaves him screaming because of its singing feeling. The entire family makes fun of Byron for the odd shape of his head and how his ears stick out of it. We are then told about how dad tinkers with the car and gets it fixed. He even gets a record player for the car that leaves momma in fumes. Dad to placate momma bells out a song for her. She then tells him that the kids need to go, that they are all visiting Grandma to knock Byron down by a peg or two and if that doesn't sort him, he will be staying longer with her. The family finally sets out on their trip to Birmingham. The long, tedious journey without stopping leaves everybody tired and the record player broken, which dad didn't want momma to know about. Kenny wakes up with a start as momma yells 'we're home' in exhilaration. Kenny is surprised to see Grandma Sands as she was nowhere close to what he had imagined her to be but a teeny-weeny old woman. Granny Sands tells Byron how he will be required to get something to eat for dinner and that she preferred being addressed as 'ma'am'. Kenny finds Grandma Sands' irritation over his momma's incessant inquisition about Mr. Robert, and momma's behavior like a little girl with a pout very amusing. The kids are happy about their swimming excursion but Grandma Sands warns them not to go to the Collier's Landing as a boy had got himself in the whirlpool and lost his life. But Kenny is insistent on going to Collier's Landing. Byron, then explains him and Joey that the 'Wool Pooh' is Winnie the Pooh's evil brother and how he snatches little kids who go for swimming there. But Kenny is just determined to experience some thrill and so he defies Byron and goes into the lake and tries catching fish. He then spots a big green turtle and decides to keep it as a pet instead of a fish since he couldn't really catch any of it. He tries to grab the turtle but fails to reach it. Just then he feels that the ground before him is cracking up and before he could make any move he was underwater. He thought he will take on the 'Wool Pooh' but couldn't as he was stronger than him. Suddenly, he sees something vehemently scratching at the water and that is none other than Byron. Byron saves Kenny who spews out and blubbers like a kindergarten child. Kenny is in total shock over the Collier's Landing accident. On a Sunday morning, Kenny wakes up to find Joey togged up in a frilly dress and black shiny shoes and goes to the Church with the neighbors. In a lethargic mood, he goes outside and sits under a tree and is lulled into sleep. He is awakened by a thunderous sound. Soon after, they learn that the Church Joey had gone to has been bombed. The family, devastated on hearing the news, rush to the Church to look for Joey. But they can't find her anywhere. Meanwhile, Kenny putters off into the crumbled Church and finds a shoe similar to the one that Joey wore that morning. He removes it from the rubble and suddenly slips into the traumatic memory of 'Wool Pooh' and thinks that it got Joey. Scared and shocked, he runs from the site and heads home. Everybody is happy to see Joey return home unscathed. Joey said she saw Kenny waving out at him and so she came out of the Church to see him. But Kenny is too traumatized and so he believes that it isn't Joey but her ghost. After, sometime he is pacified and realizes that it is indeed Joey. Momma and dad are worried about Kenny's growing 'disappearing acts'. He overhears dad and momma's conversation about bombing. Byron finally finds out about Kenny's hiding place - which was behind the couch. Byron tries to ease Kenny's apprehensive state and so he encourages him to engage in activities like watching cartoon and playing basketball. One day, Byron calls Kenny in the bathroom and shows him his first sign of manliness - his first ever chin follicles. Kenny breaks down after he sees his reflection in the mirror. He unbosoms before Byron and tells him how abashed he feels for not helping Joey. Byron comforts him by telling him that had Joey not seen him waving at her, she probably wouldn't have come out of the church to follow him. He consoles him by saying that he doesn't need to feel contrite for what happened. Kenny wants to know why some people hurt little children, to which Byron answers that some people have let hate manipulate them and have turned themselves into monsters. The Watsons Go to Birmingham - 1963 enmeshes humor and tragedy with such spontaneity that at one point you start thinking Kenny's world as your own. Right from the pivotal plot - which is the family's trip to Birmingham to the family's interactions, it keeps you engulfed with the easy style of writing and narration.